NEW! Updated MapMaster: MapMaster presents exciting place name and layered thematic interactive maps at world and regional scales for students to test and enhance their geographic literacy and spatial reasoning skills, and explore the modern geographer’s tools. The interactive maps now include additional maps from human/cultural and physical geography, complete with hints and wrong answer feedback, providing compelling interactive mapping media and assessments across the chapters. NEW! Geography Videos: Video media from such sources as the BBC are now included in addition to the videos from Television for the Environment’s Life and Earth Report. Updated Encounter World Regional Geography: Google Earth activities, organized by region, theme, and question type, include updated material and newly established best practices. NEW! GeoTutors. Included are new visual coaching items on the topics identified as most challenging for geography students. Easily assign media that is automatically graded and helps to improve students’ geographic literacy and spatial reasoning skills. MapMasterTM is a powerful interactive map tool that presents assignable layered thematic and place name interactive maps at world and regional scales for students to test their geographic literacy and spatial reasoning skills; and Thinking Spatially and Data Analysis Activities designed to help students develop spatial reasoning and critical thinking skills. Geoscience Animations illuminate the most difficult-to-visualize topics from across the physical geosciences. Quickly monitor and display student results. The gradebook captures students’ step-by-step work, and Learning Outcomes lets instructors rely on MasteringGeography to track student performance against the instructor’s learning outcomes. Give students 24/7 practice without increasing the instructor’s workload. The MasteringGeography Study Area offers self-study resources students can access 24/7. In addition, all of the resources previously available on mygeoscienceplace.com are now available within MasteringGeography, and the Pearson eText gives student access to the text when and wherever they have access to the Internet. Incorporate current events and local/regional examples in a time-saving way with RSS Feed questions and opportunities to create automatically-graded assessment questions with links to current and local web resources. A highly-respected author team of experts, writing on topics in their respective fields, now with two NEW chapter authors: Brad Jokisch (Ohio University) and Corey Johnson (UNC Greensboro), who add young, fresh perspectives and regional expertise on the Latin America and Europe chapters. NEW! A Refocus on Geography Fundamentals including more discrete basic geography information in Chapter 1, especially on map interpretation and modern geospatial tools. NEW! Read & Learn learning outcomes featuring region-specific learning outcomes in the chapter opening pages, which connect to MasteringGeography. NEW! Stop & Think review questions integrated in situations at the end of each thematic section to help students check their comprehension as they read. Expanded! End of Chapter Review now includes a more concise summary with integrated bullet points, Understanding Development of region questions and Geographers @ Work questions. A Sound Thematic Structure that includes general overviews of the region, followed by reviews of the sub-regions. “Environmental and Historical Contexts” of the region begin each chapter. Chapter Opening Vignettes featuring accessible, current human-interest stories to open each regional chapter and draw students into the geography and development issues of that region. An exploration of gender bias (Chapter 9). NEW! Updated and all-new cartography now includes maps adjusted with new data, better styles, cartography best practices, and various geopolitical events that have occurred since the previous edition. NEW! Updated photos ensure currency and provide a clearer connection with callouts in the text, plus geographic IDs are provided in all captions. Douglas L. Johnson, the Eleventh Edition editor and author of: Chapter One, Geography and Development in an Era of Globalization, and Chapter Seven, The Middle East and North Africa. Douglas Johnson is a Professor of Geography at Clark University. His geographical career has focused on the North African and Middle Eastern culture realm. Both his master’s thesis and doctoral dissertation at the University of Chicago dealt with the history and spatial implications of nomadism. Studying North Africa and the Middle East and teaching students about the complexities of this region have been a central focus of his work, including lengthy field periods in Libya, Sudan, and Morocco and visiting appointments in the Middle Eastern Center at the University of California, Berkeley and Al-Akhawayn University in Morocco. His research addresses issues of land degradation and desertification, arid land management, pastoral nomadism, and the cultural ecology of animal keeping. He is the coauthor of Land Degradation: Creation and Destruction, 2nd ed. (Rowman & Littlefield, 2007) and from 2003 to 2006 he served as co-editor of the Geographical Review. Viola Haarmann, the Eleventh Edition editor and co-author of: Chapter One, Geography and Development in an Era of Globalization, and Chapter Seven, The Middle East and North Africa.Viola Haarmann is a Research Fellow in the George Perkins Marsh Institute at Clark University. From an early age she was at home both in Europe and North America as she grew up in Germany and Canada. She earned a dual master’s degree in English and Geography, and also received her D.Sc. from Hamburg University, Germany, after carrying out fieldwork on land-use potential and change in the southern Sahel zone of Sudan’s Darfur Province. For many years she held a Sahel project coordinator position at the Hamburg geography department. Since moving to the United States, she has operated as an independent editor and researcher. She served on the editorial board of The Columbia Gazetteer of the World (Columbia University Press, 1998), and from 2003 to 2006 was co- editor of the Geographical Review. Her research interests focus on the geography of food and agriculture in the light of the expanding issues of a sustainable global food chain. Merrill L. Johnson, the Eleventh Edition editor and co-author of: Chapter One, Geography and Development in an Era of Globalization, and Chapter Two, United States and Canada, and Chapter Three, Latin America and the Caribbean. In addition to serving as a Professor of Geography, Merrill Johnson is Associate Provost and Director of Latin American Outreach at the University of New Orleans. He has a B.A. in International Relations from West Texas A&M University, an M.A. in Geography from Arizona State University, and a Ph.D. in Geography from the University of Georgia. He joined the faculty of the University of New Orleans in 1981, was Chair of the Department of Geography from 1989 to 2000, and Associate Dean of the College of Liberal Arts from 2001 to 2008. His long-term academic interests have focused on the United States South, with emphasis on its industrial and political geography. Secondary interests have included cartography, GIS, and Latin America. More recently, he has begun work on the potential of three-dimensional Internet for geographical instruction and coordinates a state-funded 3-D Internet initiative. While he has taught a variety of undergraduate and graduate courses in political, economic, and regional geography and in cartography and geographic thought, he remains passionate about teaching introductory World Regional Geography. He has taught several thousand students in more than 60 world-regional sections in his career at the University of New Orleans. Brad Jokisch, new author of: Chapter Three, Latin America and the Caribbean. Brad Jokisch is associate professor at Ohio University, where he has been teaching since 1997. He received his Ph.D from Clark University (1998), and did his dissertation work with Billie Lee Turner II before Turner moved to Arizona State. Jokisch is a specialist in Andean geography, and has carried out most of his fieldwork in Ecuador. He has written on environment and development issues in highland South America, although his main research interest is in migrants who seek employment outside their native region, particularly in the U.S. How these people continue to stay connected to their birthplace and support their natal community with remittances that foster development is the focus of much of his research. At Ohio University Brad teaches a number of regional courses on Latin America and the Caribbean at both the undergraduate and graduate levels. He founded Ohio University’s Ecuador study abroad program, and is widely traveled in central and southern America and the Caribbean. Corey Johnson, new author of: Chapter Four, Europe. Corey Johnson is an Assistant Professor of Geography at the University of North Carolina at Greensboro, where he also holds a Candace Bernard and Robert Glickman Dean’s Professorship in 2012-13. His research and teaching areas include the political geography of Europe and Eurasia, borders and border security, natural resources and energy geopolitics, and Germany. In 2011-12 he was the Joachim Herz Fellow at the Transatlantic Academy in the German Marshall Fund of the United States in Washington, DC. Originally from Emporia, Kansas, Corey holds a Ph.D. in geography from the University of Oregon and a BA in Geography and German from the University of Kansas. Robert Argenbright, author of Chapter Five, Northern Eurasia. Robert Argenbright is an Associate Professor of Geography in the Department of Geography and Geology at the University of North Carolina Wilmington. He earned a B.A., M.A., and Ph.D., all in Geography, from the University of California, Berkeley. His research focuses on the historical geography of the Soviet Union and the current transformation of Moscow. A brief tour of Moscow and Leningrad in 1975 first piqued his interest in Russia. Since then, he has returned to the region 18 times to conduct research. He has published articles on the U.S.S.R. and post-Soviet Russia in such journals as Eurasian Geography and Economics, the Geographical Review, Political Geography, Revolutionary Russia, the Russian Review, and Urban Geography. He is writing a book with the working title Moscow, under Construction. Included among the many courses he has taught at the University of North Carolina Wilmington are Geography of Russia and World Regional Geography. William C. Rowe, author of Chapter Six, Central Asia and Afghanistan. William Rowe, a native of upper East Tennessee and sixth-generation Appalachian tobacco farmer, has traveled, worked, and studied in the Muslim world for over 20 years. He received his Bachelor of Science in Languages (BSLA) from Georgetown University, with concentrations in Arabic and French. He worked at the American University in Cairo before returning to the United States for his master’s on water and population in Southern and Eastern Morocco at the University of Texas at Austin. For his dissertation his focus shifted to the newly independent Muslim nations of Central Asia with an emphasis on Tajikistan and its language, Tajiki. He spent 2 years on research in Tajikistan as it was emerging from its devastating civil war. Since receiving his Ph.D., he has continued his work in Central Asia, most notably in Uzbekistan and the Tajik regions of Afghanistan and has been able to witness the changes in the region since American involvement in the wake of 9/11. His research concentrates on the economic and environmental transformations that have occurred since independence in Central Asia and Afghanistan as well as Muslim identity in post-Soviet Central Asia. He is currently an assistant professor at Louisiana State University. Samuel Aryeetey Attoh, author of Chapter Eight, Africa South of the Sahara. Samuel Aryeetey Attoh is Dean of the Graduate School and Associate Provost for Research and Centers at Loyola University, Chicago. He received his Ph.D. from Boston University and his M.A. from Carleton University, Ottawa. He also earned a B.A. with honors from the University of Ghana, Legon. His research and teaching interests are in Urban and Regional Planning, Housing and Community Development, and the Geography of Development in Africa. He is the author of Geography of Sub-Saharan Africa, 3rd ed. (Prentice Hall, 2009), has published many articles in geographical journals, and received numerous research grants. He is past chair of the African Specialty Group of the Association of American Geographers, past treasurer of the AAG, past president of the Illinois Association of Graduate Schools, editorial board member of the Professional Geographer and the African Geographical Review, and a member of the American Council on Education Fellows and the American Planning Association. He believes a course in World Regional Geography presents instructors with an opportunity to showcase the integrative and holistic human and physical dimensions of geography and demonstrate how they relate to real world situations– whether social, political, environmental, or economic in nature. Christopher A. Airriess, author of Chapter Nine, South Asia, Chapter Ten, East Asia, and Chapter Eleven, Southeast Asia. Christopher Airriess is a Professor of Geography at Ball State University, Muncie, Indiana. He earned his B.A. and M.A. in Geography at Louisiana State University, and his Ph.D. in Geography at the University of Kentucky in 1989. Born on Long Island, New York, he spent his childhood in Singapore and Malaysia. While he has traveled throughout much of the western Pacific Rim, his favorite places are southern China, Indonesia, and Malaysia. His research interests include development, the geography of ports and maritime transport, and the human dimensions of ethnic-Southeast Asians in North America. He is the recipient of two Fulbright Awards that allowed extended visits to Indonesia in 1987, and Hong Kong in 2000. In addition to regularly teaching World Regional Geography, he also teaches Human Geography, and Geography of Asia. 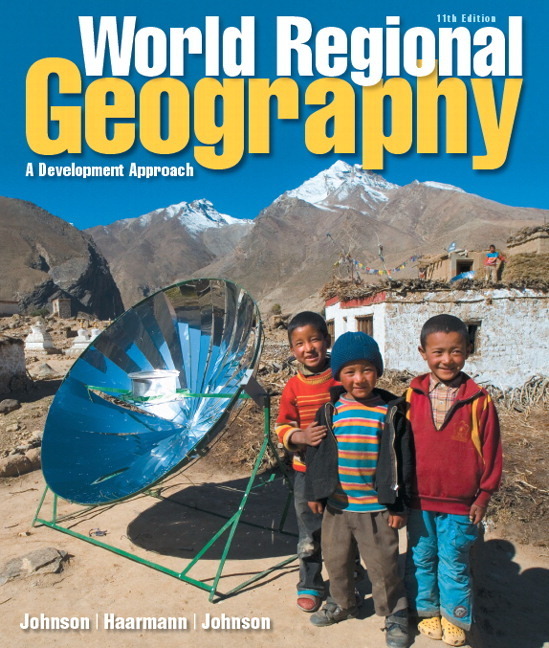 He believes that a World Regional Geography course provides an essential piece to the undergraduate educational experience by imparting an understanding of the connections between the environment, culture, society, and economic and political systems within the context of real places where the process of globalization directly and indirectly impacts people’s lives. Simon Batterbury, author of Chapter Twelve, Australia, New Zealand, and the Pacific Islands. Simon Batterbury teaches environmental studies and geography at the University of Melbourne, Australia, where he is Associate Professor and Director of the Master’s Program in Environment. His main interest is in how rural households and their livelihood systems alter, and rely upon, local landscapes and environments in countries marginal to the world economy. Born in southeast London, he studied human and physical geography at Reading University and earned an M.A. and Ph.D. at the Graduate School of Geography, Clark University, on the political ecology of natural resource management in Burkina Faso, West Africa. In Burkina he worked for two years with a German aid program helping farmers manage drought and soil erosion. He has taught at the University of Arizona, Oxford University, London School of Economics, Brunel University, and Roskilde University and has lived in Australia since 2004. He has conducted long-term collaborative research on rural development and environmental management in West Africa (Burkina Faso and Niger), Southeast Asia (East Timor), and the Pacific (New Caledonia). In 2007—2008 he was a James Martin Fellow, University of Oxford, researching global climate policy and completing a book on how geographers and anthropologists can, and should, engage with everyday environmental problems.